The skyscrapers seen around the world wouldn’t be possible without aluminum. From the St. Mary Axe in London to the GT Tower in Seoul and the Empire State Building in New York, aluminum has played a major role in construction for over hundreds of years. Before its mass consumption and application of goods like soda cans, aluminum was once considered more valuable than gold or silver. By the 1900s, its superior properties were being recognized by US business leaders and the use of the material took off in industries across the country. During the Great Depression, the mass production of aluminum took off. By 1935, the Aluminum Association held its first meeting in New York City. As manufacturers realized the material’s potential for a variety of products in items such as washing machines, space shuttles, computers, batteries, and foil to store food, aluminum was being used as a primary material more than ever. Today, aluminum continues to play a key role in the products and items we see nearly everywhere we go—inside grocery stores, offices, malls, sporting complexes, schools, restaurants, and much more. Aluminum has made these structures possible with its strength and durability. A large majority of the window and door frames seen in buildings today are a result of aluminum fabrication. Stairs and railways are also examples of aluminum fabrication. Other fundamental parts of buildings, like roof sheets, can be constructed using aluminum fabrication. The material is known for its high strength to weight ratio and ease of transportation, which is an important factor considering the cost of shipment. Air tightness allows the material not to suffer from deterioration over time. It is known to help increase energy efficiency. 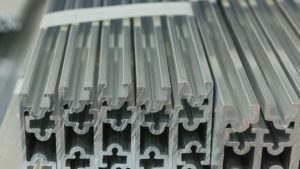 Aluminum is also recognized for its high corrosion resistance and durability. It can adapt to different weather climates and withstand both humid and dry climates, as well as extreme cold. When smoothed and brightened, the material is aesthetically pleasing. In comparison to other materials, it is versatile and lightweight, making it easier to work with. The material is 100 percent recyclable. Using recycled aluminum reduces energy consumption by 90 percent. Is weight important? If weight is a factor and you need a lightweight material, then aluminum should be your choice. Do you need a material that’s versatile and will help you save on cost? Stainless steel offers versatility in the fabrication process and is also more affordable than aluminum. Is weather a factor? When it comes to extreme temperatures, both materials are typically good options because they can withstand varying conditions, but if weight is not a factor, then stainless steel is usually a better option. At Steel Specialties, Inc. in El Paso, we offer aluminum fabrication services that will meet your construction or project needs. If you’re a contractor in need of aluminum or steel work, contact us today. We help source the material for your small or large project and will work with you to provide exactly what you need, always according to your schedule. Get in touch with us today to learn more about how we can supply your material needs. Our office in El Paso can be reached at 915-590-2337. You may also send us an email at sales@steelspecialtiesinc.net requesting a quote. We look forward to working with you.